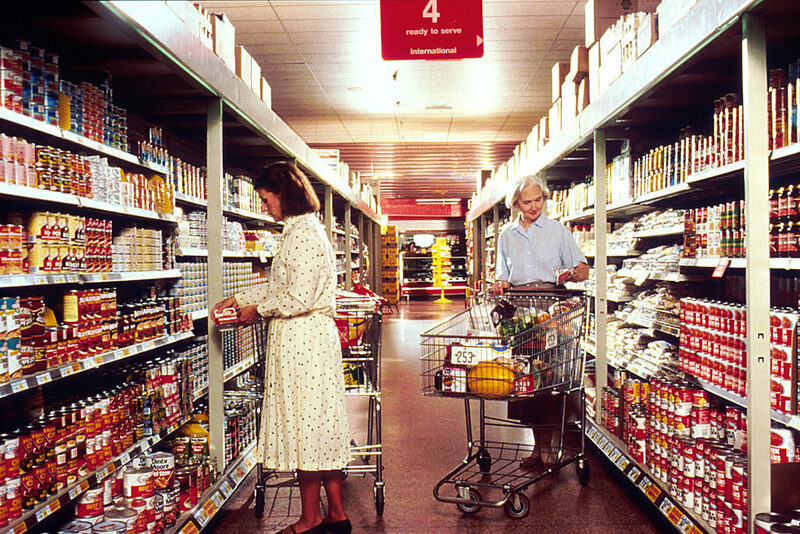 Women grocery shopping in 1989, according to Wikipedia. Image: Wikipedia. At this point, I think it’s best that I make a list. A list of the reasons why this PaperGirl has been so absentee. A list of reasons why she’s struggling. Why she is internet-skulking around, looking guilty, trying not to wake anyone up when she gets home, slinking through the back door with the stealth of a teenage ninja with something to hide. Perhaps it’s time to make a list of the reasons why the woman feels as though there is something to hide. Like a grocery list, except with guilt and creeping dread. And shame! Don’t forget the shame. I refuse to be a blogger who posts apology posts about how “it’s been so long” since she posted .. and yet, that is precisely what’s starting to happen. I used to have myself to manage. Just the one person, and that one person was someone I’ve known for 39 years. These days I’m in charge of a staff of four, roughly. That’s four (not at all roughly but perfectly) incredible, beautiful, talented, brilliant people who count on me to steer a pretty large ship. Two ships, actually: Quiltfolk and the Big Project. Between the documentary series and Quiltfolk, there is zero wiggle room. For anything. Less than zero. I keep trying to make that not true. My politics are starting to show and this is complicated. Part of what I have long cherished about my blog is that my readership is bipartisan. I have so seldom gone on record about political feelings because I need PaperGirl to be a place where humans with different ideas are friends and, because of that friendship, can listen to each other and find peace. (When you really listen to someone’s life story, it is impossible to hate them.) But I fear my beloved country is slouching toward tyranny and Stage IV bigotry. How can I be a good citizen and not speak of this when I have a public forum and thousands of friends who — were we all to move as friends to change the course of history for good — how can I be a good citizen and not do this? My fear is doing it poorly, carelessly. PaperGirl is not a Facebook post, dashed off after dinner, after a glass of wine, after watching the local news. No. This is PaperGirl, and you’re better than that. But I am no politician. My citizenry is secure. But my political engagement as a citizen is keeping me up at night. When I have 30 minutes in front of the laptop and I’m not doing work, I want to email Nick. Or read something. Or watch something idiotic. I plan to delete Facebook. I refuse to be a part of that business. They are watching us. They are profiting off our data. They don’t care about me, they don’t care about you. I’m concerned they don’t particularly care about our democracy. This is not conspiracy theory. The Facebook app on most mobile devices is set to collect audio. When you speak, what you say is being harvested. Ever talked about something with a friend and then saw an ad about it on Facebook? They’re literally listening to us. I’m not okay with that. So I’m not “hiding” Facebook. I’m not taking it off my browser. I’m not just deleting the app on my phone. (I haven’t had that app in two years.) I’m deleting Facebook. I’m gone, my darlings. There was a time when we were human beings without Mark Zuckerberg’s dorm room-inspired internet project. I want to be that kind of human. If it means I suddenly cease to exist, I’ll let you know. By mail. When I miss something terribly, it is better to just not look. This is my approach to places where I used to live. Pictures of people who I used to love or who are dead, now. I’m afraid to look at what I miss. So I didn’t log on for a week. I am not on Facebook. Glad I never was. Bob Woodward has a point. All voters need to take heed. Whatever your affiliation, we all need to pay attention to the insidious effects of bigotry in any form. Make the list Mary. But put you first. Because you’re important and facebook isn’t. Oh Dear Mary, I hope that you will find a way to continue with the blog, because what we ALL need right now is a place where people with different ideas can be friends! I long for the days when we can move away from this very narrow idea that we can only be friends with people who think exactly like we do, and realise that we can love and get along with people with significantly different ideas to us. I love your writing, and I admire you so much. I’m delighted about QuiltFolk and the film project, but I do hope that you manage to find some space in your life again for Paper Girl. Lots of Love. I love reading your posts – you make me smile with your humour – I feel for you when things are not going right – keep writing whenever you can. Take care …..
First of all, I am beyond excited about The Big Project and doing a virtual happy dance at the news. Count me as another “all or nothing” person. I relate wholeheartedly and a bit unapologetically. It is just how I am wired, although I try to temper it when it doesn’t serve me well. Follow your heart, dear Mary, when it comes to addressing politics. After all, you are the one and only PaperGirl. My feelings are in line with yours; however, even if they were not, I believe in listening and respectful dialogue. I would like to think that most PaperGirl readers, even those whose do not share your feelings, would feel the same. After all, if they follow you, how could they not know your heart? I have never had the app on my phone, but also wrestle with the Facebook thing. I reactivated about a year ago to keep up with long distance family at their request but there are also so many organizations whose main content and virtual community operates via Facebook. For example, Project Linus just started their annual mystery quilt challenge fundraiser, which I enjoy participating in. Deleting it is a tough decision that I haven’t finalized yet. Ultimately, I think it comes down to the fact that I do not want to endorse Facebook’s practices by virtue of participation. I do miss you when you are absent but am so thrilled that you are living a full life! I was thinking about you the other day, and worrying that you were over extending yourself…..remember that you DO have health issues. Taking care of you is a major thing to do. Do what you have to do. And as far as Facebook…..who knew they were listening? Once a day, once a week, once a month hearing from you is all good. No need for apologies. Our inboxes welcome you with open arms every time you visit. Do what you need to do. Life is big and and you are living it large. Go for it! Papergurl(yes I know)and us will still be here. Facebook is a compromised commercial forum at best, and Big Brother at its worst. Friends and contacts were far stronger before this venue came along. No worries. As for politics, many steer away from such because of its polarizing effect. Does that mean we cannot express an opinion? No. But beware of painting others with a broad brush. The only thing that the last two years have taught me is that the Democrats are just as culpable as Republicans in playing politics with perceptions through exaggerations, antics, and selective memory (and this is from me, a lifelong Democrat). So, while keeping our standards and morals, all should refrain from labeling people and lumping them inside drawers marked with derogatory names. [Like Trump or not, the reality is that it was Hillary Clinton’s election to lose and that is how she lost it: by making the election about us vs. them. No one likes being put down.] In truth politics, like most subjects, is fairly nuanced and seldom is something this or that, black or white. Yes, there is a limit to what is relative, but the current hysterics will drive one to craziness – if you let it. All that said, take a deep breath and forge forward. You are not alone and have many others who feel as you do. We all look forward to your great accomplishments around the bend. And then after that bend will surely be another turn. That is the way of life. We The People can make a difference. Vote!!! Your post reminds me of Mr. Rogers. it is you we like, just the way you are. we love you Mary! I can’t say anything really different than anyone else who has left comments. But I will repeat some of the things that hit close to home. 1. Your first priority is you! 4 . Take care of yoursef and everything else will fall into place. Thanks for all you do, Mary!! I so enjoy your blog, as far as I concerned you can pretty much write what you want and I will still enjoy reading it. We are living in a scary world and big brother is listening, but what is really scary is we don’t know who he is. Remember, that no one can make us who we are not. We are not bigoted, ignorant folks that will be bullied into believing lies. We are a group of good people that believe in democracy and the right to keep and make quilts !!! Do what you can, when you can – we’ll be here to read, listen and commensurate ! I have long been very political and, of late, have really questioned what it is doing to me. So when I feel like this, I turn to quilting. Quilting is a refuge. A safe place. No one knows my politics and I DON’T want to now theirs. I just want to wallow in quilts, in strips, in fat quarters. Please don’t give up on the blog. Please don’t let politics enter the quilting world. We need you and we need a safe place to be with you. As for Facebook–I am glad I have never been on it and never will. That’s another upsetting conversation we can skip. SO GLAD YOU POSTED TODAY!!! Delete it! I left Facebook a couple of years ago; not only do I not MISS anything about it, I am much happier, more relaxed, and spend less $$. Personally, I think I am safer, too. Most of what you said is very true. BUT instead of being in a state of angst, TAKE CARE OF YOURSELF AND YOUR LIFE FIRST! If that means giving up something such as this blog, do so. Prioritize…..you’be been blessed with the opportunity to get an education, use it properly and revel in your accomplishments. Get a personal life, a little therapy and stop flagelatting yourself!! Chin up…..move ahead. I don’t care that Facebook is listening. I’m doing nothing, saying nothing, posting nothing, that’s immoral or illegal. If perchance I do, I have a dear (former hippie) quilter pal who will bail me out, as I will do for her! Meanwhile my quilt guilds (yes, four of them) and my charities are on Facebook, as are my town’s activities and township meetings and library events, and that’s how we keep in touch and active. So much more convenient than phone calls, we can plan road trips and retreats as groups! I can also easily keep in touch with friends caring for relatives who are far away, and continue moral support for them. So so needed. 2. Post when you can even if it takes a while. Your friends love you and will still be here,happy to hear from you. 3. We understand. I for one agree with you but am still willing to be friends with people who don’t agree. That’s the best kind of world. Mary – I am very happy that you feel you can share things with us. The Big Project sounds wonderful. Something I wish my Granny was still alive to see (when completed). She was one of those southern ladies, poor, her quilts were made from the good parts of worn out clothes or from fabric family sent to her (left over from sewing garments for their family). I will ramble here – I felt that era was still alive until my Aunt recently died. She was the last of that generation. So sad. Reminds me of all the questions I wish I would have asked my Granny and Papa while they were still alive and the questions I would have asked my Mama and Daddy if they were still alive…. I never felt my Granny and Papa were poor. They gave so much love. Granny gave me 8 lovingly made quilts when I moved to Yankee country (Iowa) in 1973. I still have most of them and continue to use them. She made durable quilts, working people’s quilts, quilts that would stand the test of time and yet, they were made of leftovers and old clothes…. They may not be as pretty as the quilts I make now but, the love that was put into them is still felt. Every stitch was by hand… she never had a sewing machine. You GO GIRL! Make YOURSELF proud! Make YOURSELF happy! Hang onto Nick – he sounds like a catch! Thank you for biting your tongue all these years concerning politics. It’s been hard I know. Mary you know where we are, we know where you are. We will always be here for you. Voting is our power,our voice. Scream loudly and stand for your beliefs. Maybe Mary for president? That works for me. All the world needs to quilt, and more scraps for me! Mary, I love you, and of course it’s your right to eschew Facebook, but please don’t use your platform to spread disinformation (we have plenty of that going around already). You can’t just declare that it “is not conspiracy theory…[Facebook is] literally listening to us.” There is no consensus that that is true. Faithful reader here who has never met you irl, but still hopes to say thanks for everything – in person. The Big Project made me catch my breath with a little goosie thrill. No words for how wonderful this is. Write Papergirl when you can. Each will be more special because they are rarer. See how that works? Also, politics is firmly in quilting. I see it all the time and it makes me like some of those people a lot less. And interact with them less, because I fear our country is entering its death throes. Read this book if you can manage the time Mary: How Democracy Dies. We need to talk. SAQA is publishing the definitive history of the art quilt movement: “Art Quilts Unfolding: 50 Years of Innovation” (Schiffer, Oct. 2018). And I’d love to share the resources that went into the book with you for your Big Project (which of course I don’t know about). Was so glad to get this latest post! When there is a bit of time between posts, I find myself fretting not only for myself, but for you because I know how much you need/want/like/love to communicate/chat with us. I had to let this one percolate on the back burner a bit. Probably because we seem to be in the same boat. Again. I struggle with the entire issue of Facebook. Truthfully the main reason I use it is to shed light on my card shop and my blog. So called ‘experts’ have touted the need for social media connections. My numbers tell me a different story. The secondary reason is that I stumbled over a really great closed group who remind me very much of what us Internet Old Timers (get me my cane, would you?) recall as message boards. There is so much finger pointing, name calling and holier-than-thou going on that I actually find myself missing those grand old days when message boards would seemingly implode only to rebuild and continue. It is exhausting. Depressing. Frustrating. I look for places where conversation, communication and a sharing of ideas is important (hence the closed group I mentioned), but that is an extreme rarity because folks are shell shocked and more than a little … defensive. Papergirl is a patch of bright sunlight. I hear ya about Facebook. Some of my friends have dumped it, and for some of the reasons you cited. I miss seeing them on there, but I understand. I’m new to Papergirl, and I love your posts. I’ve had GI problems most of my life, so I can relate somewhat. Past that, I feel like I’ve gotten to know you through your posts, and I really like you. I hope you keep Papergirl going. Glad I read this before it self destructed 😉 The honesty in your work is something I’m sure we all appreciate, and being honest about your commitments is both admirable and a good example for people like me who are still learning. Say what you want here. We love your ideas and delivery, doesn’t mean we all have to agree (though I usually find I do). Your posts are the ones I pick through all my other subscriptions to read, and they’re a nice treat no matter how frequent. xo. Dearest Mary, please don’t leave us. We’ll take you when we can get you and Paper Girl. But please do take care of yourself. Your upcoming project that we don’t know about sounds amazing and I can’t wait to hear more about it when you can post more about it. Meantime, try to catch your breath and remember, you are more important than anything else on your plate. Hope you’ll be able to get back to Winterset some time soon. If and when you do, know that there are a lot of hugs waiting for you. I have loved and laughed and cried reading your blog for years (ever since your sweet Mom did a HUGE act of kindness and generosity for my sister, Libby Lehman, and at the same time introduced me to your beautifully written blog.) So I say this with nothing but sincere concern for you – IT MAY BE TIME TO GIVE YOUR BLOG A REST. You have so many exciting things happening in your life right now, and it sounds like you need to “make more space” for some of them. I am not a quilter or a writer, but I do know what it is like to have a job (or two), a very special man in my life, and a dozen other projects that I love – all needing time, attention, and nurturing. I would miss your blog, but I would salute and support you for moving on to even bigger and better things. Mary, I am a new “fan”. Attended the last 3 lectures this past 2 months, because you were traipsing through my back yard. So much of what you shared really resonated with me, and drew me in. I started quilting in 2008, and have been just schlepping along, sewing straight lines and reading a little. I’ve been overworked ( which I’m disgusted to say, cuts into my creativity), went through another dance with cancer, am finally approaching retirement time, and have of late been delving into quilt history myself. When I heard your story, it stopped me in my tracks. Remember, you and your health come first. I will keep you on my radar, but make sure you do what you need to do to stay healthy. Love you, girl! So you are quitting the blog as well as Facebook. Last time I looked at FB your page was still there? Would be sorry to see your blog go away – signed “Call Girl” from when I got to speak to you and your mom on your podcast. We met in person at Puyallup Show and you signed you hand out “our call girl”. If you leave us, we’ll miss you, but know that we’ll always love you and keep you and all you cherish in our hearts. And we’ll see you as you publish great things. You’ll be there. Are you OK Mary Fons?? We miss you. and in a way you are. You and your lovely mother are cut from the same beautiful cloth. the way you have inspired so many and your amazing talents. May God bless you with all that brings you joy. Thank you for all the happiness you bring. I’d love to meet you in person, to say a great big “thank you”. Keep it real, “Keep it Mary”. Make my tasty coffee in the morning , make the bed, try to fix my crazy bed head hair, read Mary Fons post, and begin the day. missing. No grounding, no reassurance that there are still good people out in the world, and most important, no Fons perspective. I miss, we all miss, starting our day with Mary. Mary, I used to know a wonderful woman a lot like you. So much like you, in fact, that she *was* you ;-). Earlier today, YouTube suggested an interview with Liza Minnelli. Why? Who knows? YouTube moves and suggests in mysterious ways, much like the more compelling among us. Upon sight of the thumbnail with the pixie-haired Liza, I said to myself, “Wow, she looks familiar. Do I…? Is that…? Hmm… Ah: yes. *Now* I know who I’m thinking of.” So I turned to my assistant (Google) and asked it to see what you were up to these days. I said to you once at The Green Mill that I admired your energy. That’s still true and likely always will be. I’m pleased — and not surprised — to see that you’re still doing great things!